You can book an appointment online here. If you can’t find what you you’re looking for please do call us on 01440343, as our online system doesn’t always show all available options. Our most available appointment options are for Swedish Massage. The Pilates Method is a unique approach to exercise that develops body awareness, improving and changing the bodys’ postural and alignment habits, increasing flexibility and ease of movement. It is an exercise method that focuses on the core postural muscles that help keep the body balanced and are essential to provide support to the spine. Combining elements of yoga, martial arts and other forms of physical training Pilates makes for an excellent all round exercise system for mind and body. Classes taught at pure health are mainly matwork with occasional use of fit circles and thera bands. Pilates is a body mind system that was developed by physiotherapist Joseph Pilates; He drew on a varied background of his experience as a physiotherapist, along with a knowledge of many exercises including yoga, martial arts, dance etc. What do we do in a pilates class? Pilates is a series of exercises designed to gently tone, strengthen and increase flexibility. The main target is abdominal, or ‘core’ strength. There will be emphasis on technique, control, and breath. While a lot of it is done on the mat, there is also standing work sometimes done, along with use of props such as fit balls, stretchy bands, magic circles etc. Because of the emphasis on core strength pilates can be particularly good for people with back problems, but as most people lack in this area anyone will find it to be beneficial. It is an excellent way to keep fit, get strong, and relax at the same time. What do I need for a class? Just bring yourself and an open mind. We have mats that are free for you to use on your first class, then €1.00 per class after that. We also have a range of excellent mats to buy, from €18.50. Wear comfortable clothes that you can move freely in, and turn up at least 10 minutes early to register on your first class. Our classes are ongoing, so you can join anytime. What should I expect in a class? Expect to switch off and be guided through a flowing and energising workout; along with some breathwork and relaxation. Do I need to be fit, strong or flexible? Absolutely not! When you practice pilates consistently you find a lot of positive physical changes occur, so you don’t even need to think about it. Just let go and allow yourself to be as you are, have a willingness to not push to hard and you will find you become flexible and stronger much more quickly. I have an injury, will I be able for it? As it was designed by a physiotherapist it is very good for those with injuries or who haven’t done any exercise for a long time. Just give yourself time and be gentle. Please see our timetable. Classes are ongoing, you can join anytime. What if I miss a week? Our class packs have an extra week in them, so you don’t need to worry. Also you can come more than once a week, and you don’t have to the same class every time, you are free to move around. At pure health we only use the smaller props. Can I start with one to try it out? We ask that you try it out with a minimum of 6, as this is what we believe you need before you get used to it. By then you will be able to feel the benefit and understand it better. Remember you are doing it for a good reason, and you will need time to see results. Thank you, you have been subscribed to our updates! Take the opportunity to gain some of the many benefits of massage which include: pain relief, reduced anxiety and stress, improved circulation and sleep, among many others. All our massage treatments are customised just for you. We offer a range of massages; the Swedish Massage, Full Body Massage, Hot Stone Massage, Deep Tissue and Sports Massage are all incredibly popular with our clients. View our full list of massage treatments below. The ancient art of massage has been used throughout the centuries to soothe aches and pains and facilitate the body’s own healing powers. With today’s busy, stressful lifestyles, there’s never been a better time to take advantage of the benefits of massage therapy. 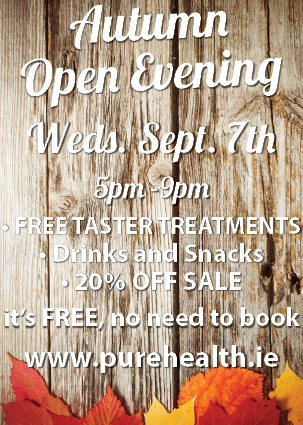 Once you arrive at Pure Health, you will be greeted with some filtered water and asked to fill out a massage registration form. This is where you record any medical history, past/present injuries and other physical conditions we should be made aware of. Your massage therapist will then review the form. They will inquire about the reason(s) you are coming in for a massage, your current physical condition and any specific areas you would like to address during your massage. It’s always useful to arrive 10-15 minutes early for your first appointment. This will give you time to complete your paperwork and take a few minutes to relax, unwind, and get the most out of your experience. Your massage therapist will then take you to a peaceful, spa-like treatment room with a comfortable massage table. You can take a seat, leave your personal possesions in a safe area while your massage therapist leaves the room and waits outside while you disrobe to your level of comfort. The massage etiquette varies from client to client. Mosts clients choose to remain partially clothed, and of course feel free to talk to your therapist with any questions you might have. Once disrobed, you will lie on the massage table, under the top sheet or towel. Your massage therapist will give you a few minutes for this process and will knock on the door to ask if you are ready before entering your room. Before beginning the session, your therapist will ask you to alert them if, at any time during the session, a technique they are using is uncomfortable. Depending on your specific needs or requests, your massage therapist will either perform a customised massage (for general relaxation and stress reduction) or focus on the specific parts of your body that you have requested. You will always be draped with the top sheet or towel during your massage session. You can expect a tranquil and comfortable environment during your massage. The massage table is padded and the rooms heated to your comfort level with low relaxed lighting. There will be relaxing music playing, which you can choose should you wish to. This is your customised massage. If you have feedback on pressure, room temperature, lighting… let us know. Once your massage therapy session is complete, your therapist will leave the room so you can re-dress. Your therapist will wait outside in the waiting room for you with a cup of filtered water, and then take you back to the reception area when you’re ready. Here you can choose to relax with a cup of organic tea should you wish. After the treatment drink plenty of water, as this flushes out the minerals that were released during your massage while rehydrating your muscles and reducing potential soreness. We look forward to seeing you for your first visit. If you have any questions about the etiquette during a massage, we will be happy to answer them for you, you can always email or call before hand should you wish. Yoga is an ancient tradition, consisting of a physical practice, which we know best in this western part of the world, but also a vast body of knowledge and philosophy. The basic principles are good, common sense, guidelines on how to be a decent, honest human being. From the physical practice we get astounding benefits, toning our bodies, increasing flexibility, regulating our metabolism, increasing circulation to our internal organs. Our health and fitness improves dramatically with regular yoga practice. With this practice, and by stilling our minds in each asana, feeling what is happening inside us, we also find a balance coming into our lives and personalities. A more clear mind, slower to get angry or stressed out. We become more aware. In the modern world, we have no time to think, we are stressed, over worked, under paid. Yoga helps you to come back to who you really are inside, and find that inner joy and peace again – it’s still in there, you just need to tap into it! Yoga is truly for everyone, there is no-one too old, or too young, or too injured or crippled to start. From just a few regular practices, you will start to notice a change in your body, and it just keeps getting better. What do we do in a yoga practice? Although Yoga is a vast system of knowledge and has many different forms, in this time and place, has become a posture practice, which has many far reaching physical and mental benefits. Yoga posture practice is a system of exercises, movements, stillnesses and sequences designed to strengthen, tone and detoxify the body, increase flexibility and stability in the joints. Breathing exercises (Pranayama) increase the detoxifying effect, cleansing and regenerating the body at a cellular level. The ultimate traditional ‘goal’ of yoga is to achieve enlightment; however as most of us don’t live in a cave and it is the 21st century this doesn’t tend to be an all consuming passion, and we have different goals. The idea of doing the posture practice in yoga (or ‘Asana’ practice) is to remove all dis-ease from the body, making it strong, supple and stable so that no pain or illness distracts the seeker for their path of enlightment. Of course the enlightment we now seek is simply to de-stress, to rid the body of the discomfort of back problems, headaches, insomnia , weight gain etc; the good news is that with consistent practice of yoga you will get what you are looking for, and a lot more positive change in your life as a bonus. So as we cannot go and live in a cave under the guidance of our guru for 8 years (and would have no interest in doing so! ), we simply approach yoga as a posture practice, allowing yoga to evolve and be valuable to us in our time and culture. Absolutely not! When you practice yoga consistently you will become all of those things, so you don’t even need to think about it. Just let go and allow yourself to be as you are, have a willingness to not push to hard and you will find you become flexible and stronger much more quickly. Will yoga really help me achieve my goals? Absolutely YES! With regular and consistent practice – that is the most important thing of all. Suitable for absolute beginners, or those looking for a slighter softer practice. Stay here until you feel you can take more challenge, or stay if you like it just the way it is. Don’t be afraid of challenge though, it may be just what you need! Talk to us if in doubt. You are never too advanced to practice at this level. As Dynamic Yoga is very alignment focused if you have practiced another style of yoga before it may benefit to you go back to basics and focus on the alignment principles. Suitable for an absolute beginner who leads an active lifestyle, or again for anybody looking for a slighter softer practice, or if you have been previously inactive but done at least 6 consecutive yoga classes. Suitable for those who have been practicing yoga consistently for at least 3 months and feel they would like more challenge. Expect to hold for longer and to start to do more challenging postures with more flow in between postures. You will always have the option to rest. MIXED LEVEL / OPEN TO ALL LEVELS. This will always be taught at a suitable level to those present, there will be options given to go further or back off. Be sensitive to yourself and practice at your appropriate level, without judgement, and just enjoy it! Suitable for experienced practitioners only. You will need to have done a minimum of 6 months regular practice, if in doubt about if you are ready to try it then speak to us. Expect to hold longer, to move onto the full version of each posture, and to do more advanced poses such as hand balances and more inversions. Level 1 (FOUNDATION) – Introduction to the mat. This class is designed to teach & re-enforce the fundamentals & beginning movements. For those who have never taken pilates, less experienced pilates participants, those recovering from an injury, or those who would like a more gentle session. Level 1-2 (IMPROVERS) – some experience required. Recommended after a minimum of 6 classes in foundation. Working on building up more stamina in the core & introducing more challenges from the pilates repertoire. Modifications & props are incorporated to increase the challenge of specific exercises. Level 3 – This class will take you through the essential pilates exercises with higher reps at a quicker tempo. Props such as the fitness circle, toning balls, flex-band & foam rollers are used to increase the challenge of the essential exercises. Level 4 – A minimum of 6 month regular class attendance is recommended for this level. Precision, control & flow is the emphasis of this class with added movements requiring strength & balance. Also includes standing pilates sequence & increase challenge utilising various props. Mixed level – this class is suitable from levels 2-4 –not for beginners. An all round workout utilising props & modifications suitable for various levels of experience on the mat. 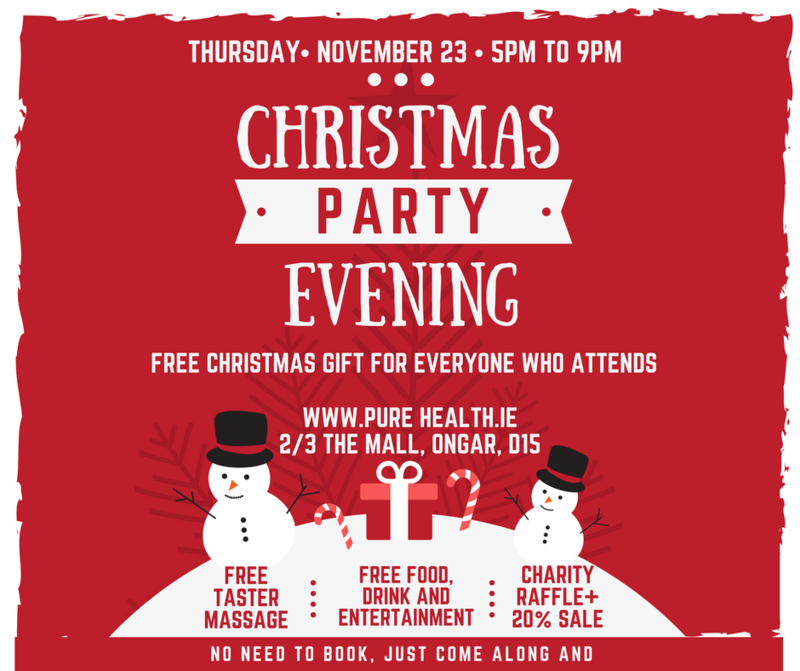 Here’s your invitation to our Free Christmas Party this year. Everyone who attends gets an early Christmas present from us! 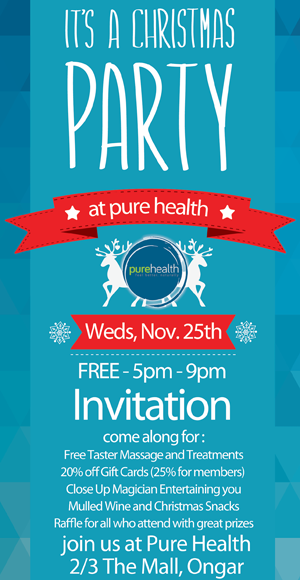 Thursday, Nov. 23rd from 5-9pm. No need to book in, just come along.